"Sleek, cool and made from piqué cotton, they're the refined edge every dinner suit needs." Formal men's shirts have come a long way. No room for '70s frills, dressing up nowadays is about sophistication and elegance. While business shirts are a practical choice for everyday wear, men's dress shirts are made exclusively for eveningwear. They're an appropriate mix of classic and modern: a bibbed front with or without pleats. Sleek, cool and made from piqué cotton, they're the refined edge every dinner suit needs. Like suiting, men's formal shirts follow trends with certain styles dominating for periods in time. The most traditional choice is the butterfly collar, the two peaks paired with a collarless shirt. These sit above the bow tie and give a classic look with a dinner suit. The other more modern option is the closed collar popularised by Tom Ford. Following the style of business shirts, dinner shirts with a full collar still have bibs and pleating, but can be worn buttoned up without a bow tie for a more fashion-forward look. For those who don't feel dressed up without a tie, a bow tie and a slender black necktie are interchangeable, though for traditionalists a bow tie is the only option. 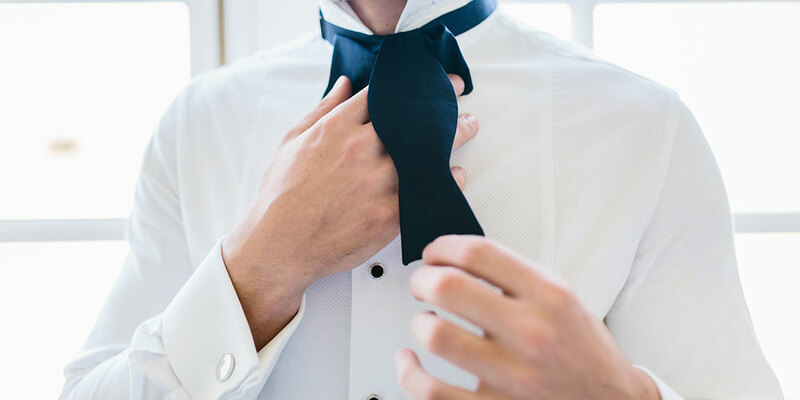 For white-tie dress codes there's less flexibility and tradition is always best. 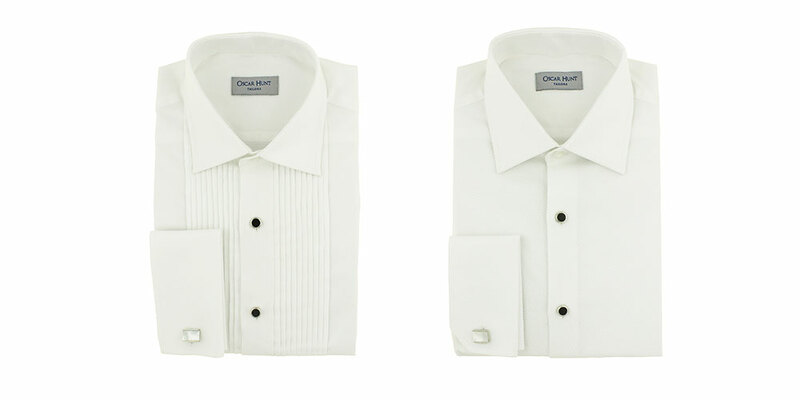 Formal shirts with french cuffs are the preferred choice for male formalwear. Cufflinks are the more dressed-up version of closures, although buttons are acceptable if they're more your style. Shirt cuffs should fall a centimetre below the hem of the dinner jacket to give your look correct proportions. A french cuffed shirt will have the requisite stiffness by default, a buttoned cuff will have to be high quality and might require starch to look its best. Men's formal shirts call for other accessories to elevate them to their most prestigious. Simple black or silver metallic studs have always been the refined choice for gentlemen. Designed to be worn with a starched bib through specially designed buttonholes they are a super chic alternative to buttons. Studs first came into use in the Nineteenth Century when starched shirts were too stiff to close with buttons made from traditional materials, such as mother of pearl or horn. Today they're a way to demonstrate a refined knowledge of gentlemanly dressing, and a good set of studs will last a lifetime. Ask you tailor to advise on the latest formal wear trends. Your dream dinner shirt is not far away.